The research team, led by neurologist Valerie Sim, discovered that a miniscule change in the prions’ makeup appears to give the disease the ability to adapt – to mimic and recreate new strains with which it comes into contact. The team has been studying this area for two years. 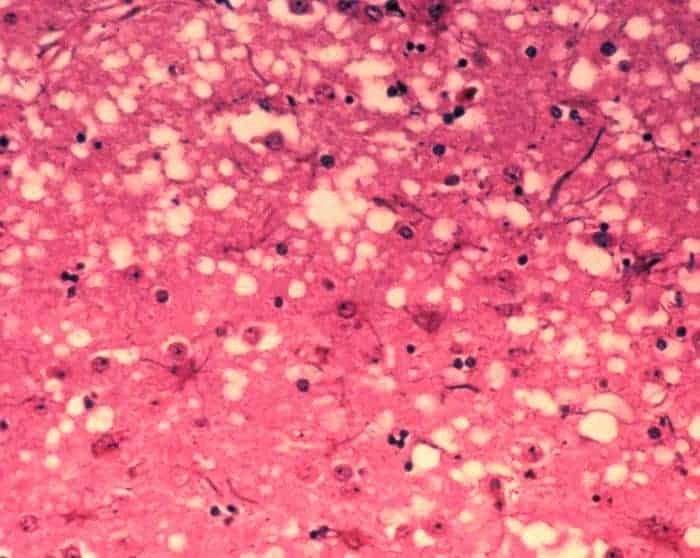 “Prion diseases don’t always successfully go from one animal to another, but when they do, the process is called adaptation. And we want to figure out what triggers that process to happen, what changes happen within prions to allow the disease to spread,” says Sim, a researcher with the Faculty of Medicine & Dentistry, whose discovery was recently published in the peer-reviewed Journal of Biological Chemistry. “One of the important things researchers in this field have realized is that if you pass certain strains of prion disease through a number of different hosts, the disease can adapt along the way and increase the number of susceptible hosts. That’s the big concern right now. Sim and her team are continuing their research in this area and are seeing impressive results in the lab – reconfirming their findings through the testing of additional models. Her team’s research was funded by Alberta Innovates – Health Solutions (AIHS), PrioNet Canada and the Alberta Prion Research Institute. The Alberta Prion Research Institute had similar sentiments about the discovery. “We are proud to support Dr. Valerie Sim and her research on prion biology and the mechanisms that lead to prion diseases,” said Kevin Keough, Executive Director, Alberta Prion Research Institute (APRI). One would also have to consider the fact they’ve shown feeding meat to a giraffe causes encephalomyelitis and that is considered to be a prion disease , so , might a carnivore like a fox or wolf assimilate a ‘natural’ diet / meat differently than a herbivore inadvertantly fed meat in the zoo , such as the giraffe and the all too known lemur mishaps where the meat adulterated food was given to the herbivore lemurs and wiped out the lemurs in all the zoos in the country , due to prion disease ? So , in cows where we have been feeding them ‘protein’ which is ground up animal carcass , have we introduced it to the human chain , by feeding cows meat ?